A, AH, AI, AN, ANH, AO, AOS, AR, AW, AWH. DLTX18, DLTX19, DLTX24, DLTX33, DLTX38, DLTX39. Choke lever is for electric start tractors. Please ensure you are using clean fuel. If your fuel tank is rusting (or has water in it), this will contaminate your fuel. 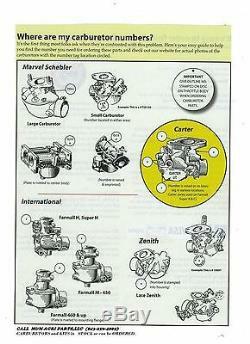 If your fuel is contaminated, then replacing your carburetor with a new one will not fix your problem. If you have an "issue" with the new Carburetor we will have it addressed according to the issue. No buyers remorse - learning from trial and error on New Carburetors. 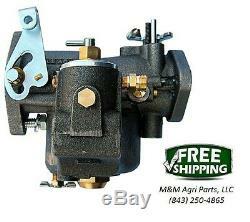 The item "New Carburetor John Deere A AH AI AN AO AR AW AWH Tractor DLTX 18 19 24 33 71 72" is in sale since Saturday, January 19, 2019. This item is in the category "Business & Industrial\Heavy Equipment, Parts & Attachments\Heavy Equipment Parts & Accessories\Antique & Vintage Equipment Parts". The seller is "mmtractorparts" and is located in Hartsville, South Carolina. This item can be shipped worldwide.